Duralex metalPRIME™ is a water based anti-corrosive primer offering excellent long term resistance to rust and corrosion for mild to medium, light industrial environments. 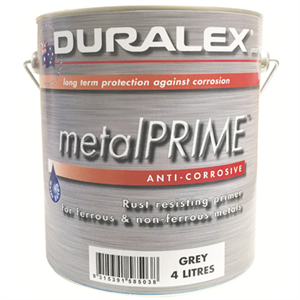 With outstanding adhesion to both ferrous and non-ferrous substrates Duralex metalPRIME™ can be top coated with a choice of 1 pack or 2 pack, water based or solvent containing products such as polyurethane or epoxy paints. Designed primarily for the protection of exterior steel, it is also suitable for stainless and galvanised steel, zincalume and aluminium. Ideal for interior structures and surfaces. Sizes 250mL, 500mL, 1 Litre, 4 Litre, 10 Litre and 20 Litre. Coverage Up to 11-13m² per Litre per coat.